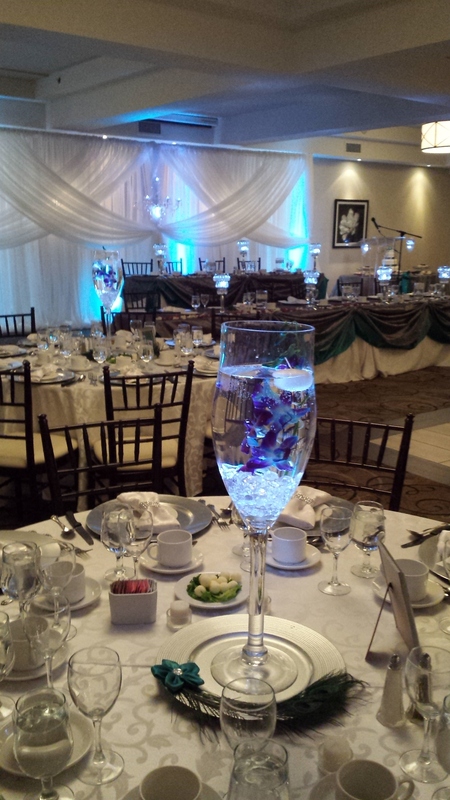 Last weekend was a great start to the 2014 wedding season with a peacock themed wedding, but with an elegant twist and some perfect pops of color. The bouquets included white roses, raspberry roses, peacock feathers, dendrobium turquoise orchids, cymbidium green orchids and green hypericum berries. 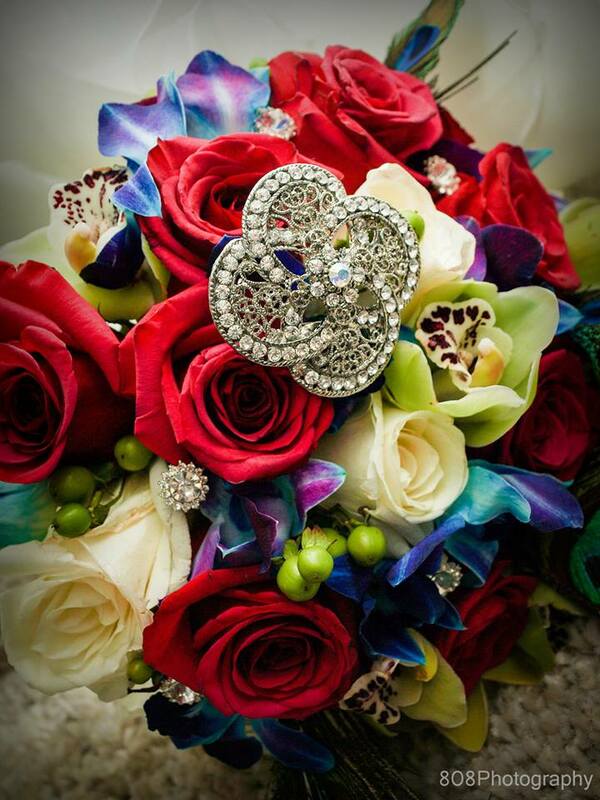 The brides bouquet was completed with crystal embellishments for that little bit of extra bling. The men had a nice matching sequence that of course included peacock feathers. 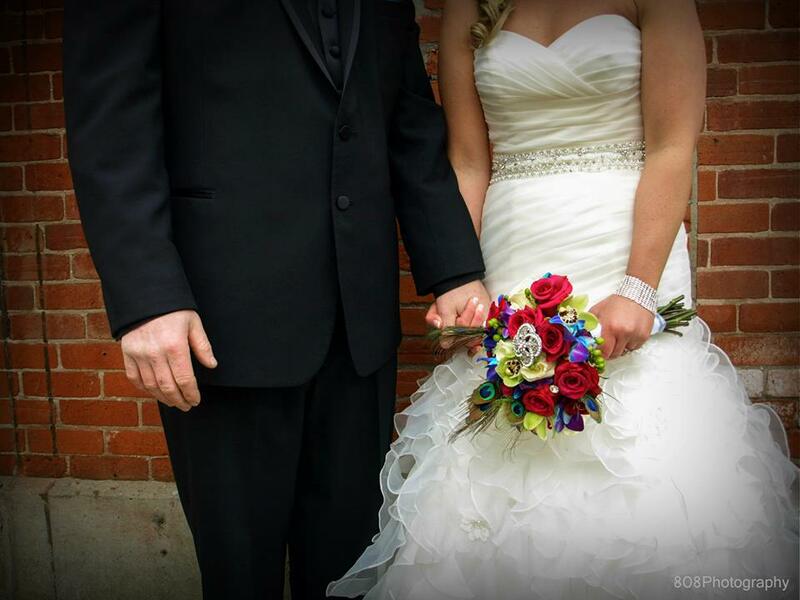 A big thank you to 808 Photography for providing a few of the gorgeous bouquet shots! The ceremony and reception took place at Marquis Gardens in Anacaster. 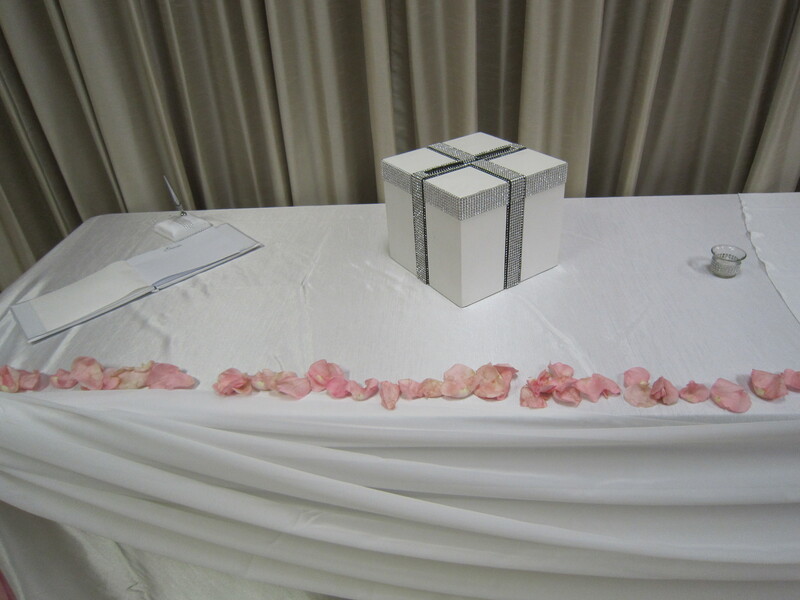 The ceremony was setup with a sheer white backdrop and a triangle at the focal point to create a focal point to the ceremony. 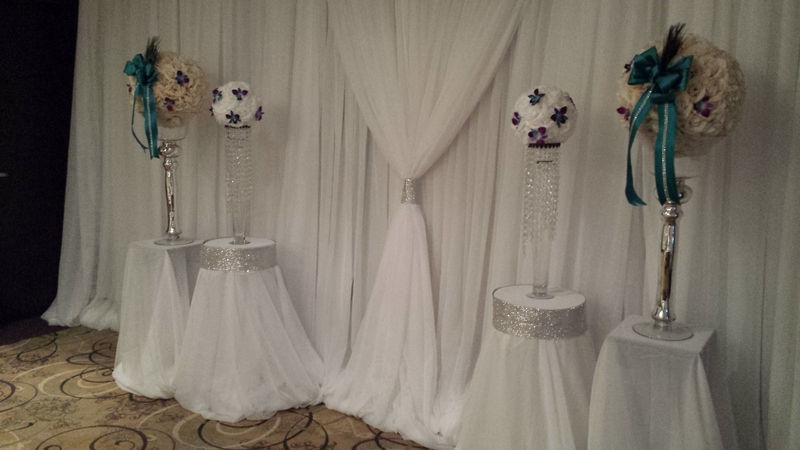 We also included some stands draped in white material with vases and flower balls all dressed up to match the bride and grooms theme. 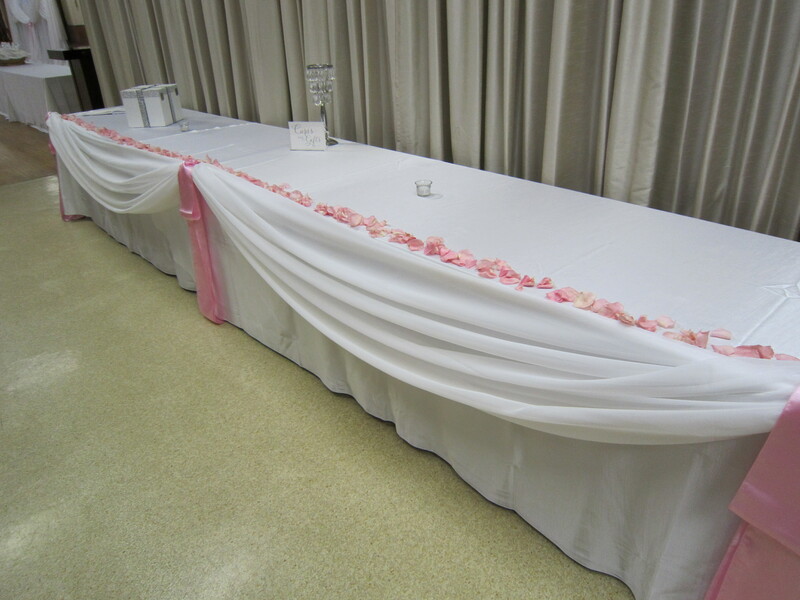 The bride made the pew bows which tied everything together and had the perfect amount of crystal embellishment. 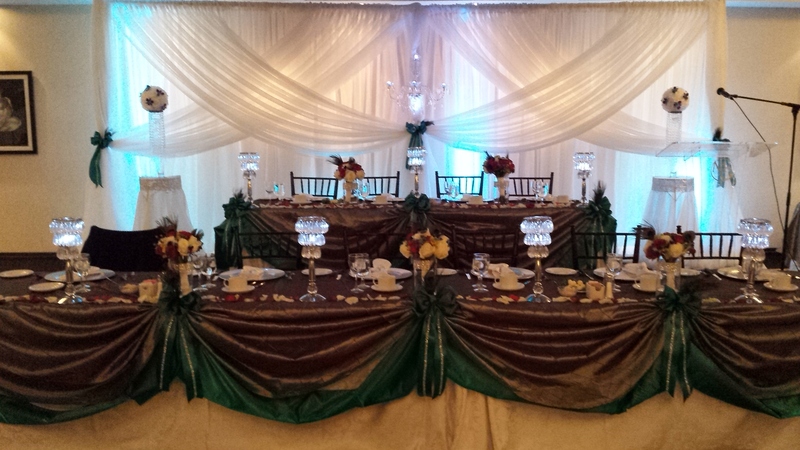 For the reception we added our fancy style chandelier backdrop which followed down onto the head table with our mini chandeliers for the head table. 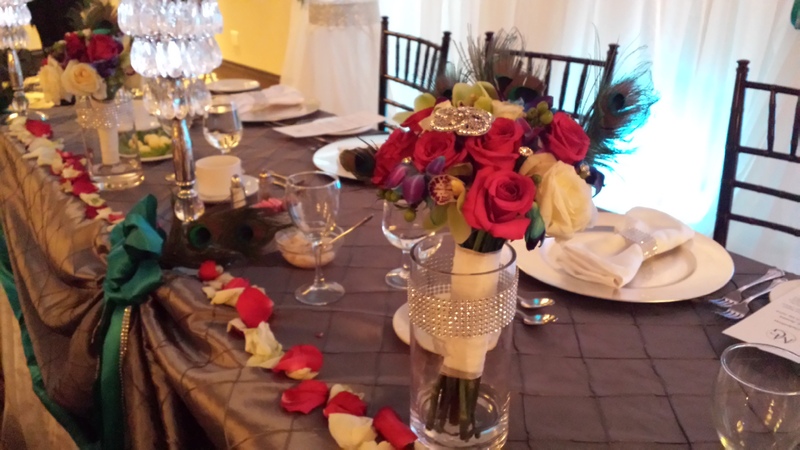 We completed the final touches in the reception with a dendrobium orchid in the centerpiece as well as some rhinestone napkin rings. The bride custom made the chargers for under the centerpiece to bring in the peacock feather. 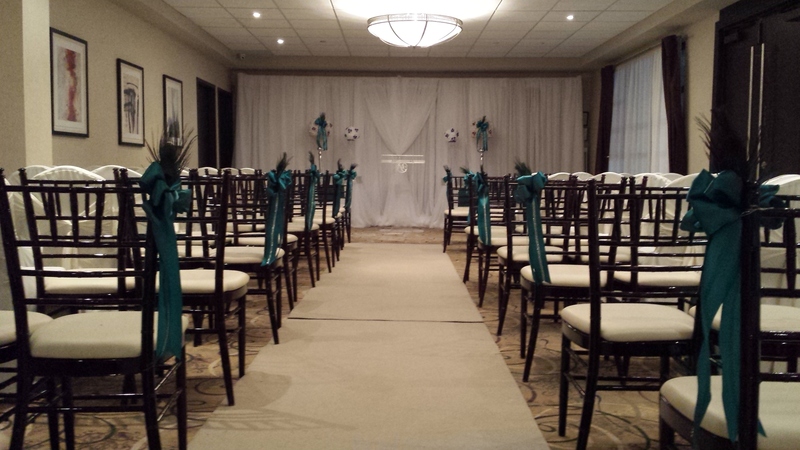 We are so happy to been a part of this special day for Shauna and James and wish them all the best as husband and wife! 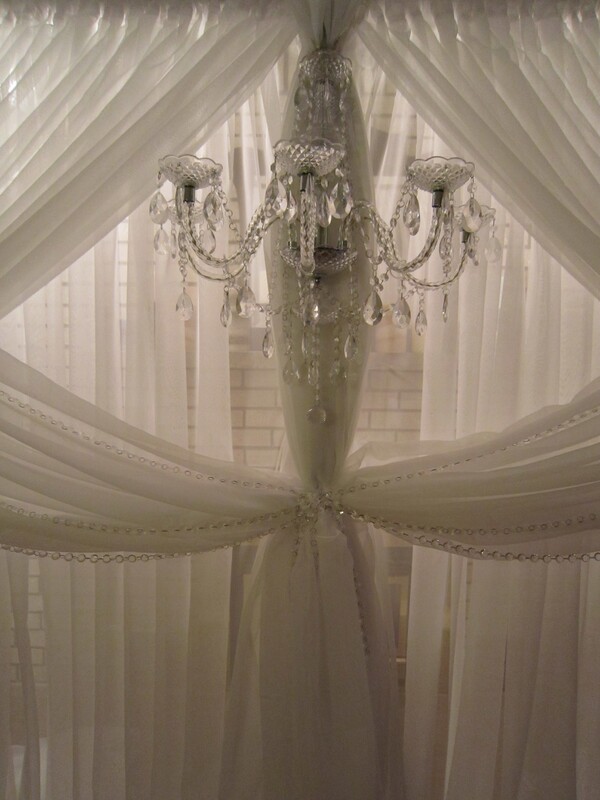 Set The Mood Decor’s second wedding we are featuring from this weekend is our first wedding featuring our chandelier backdrop. 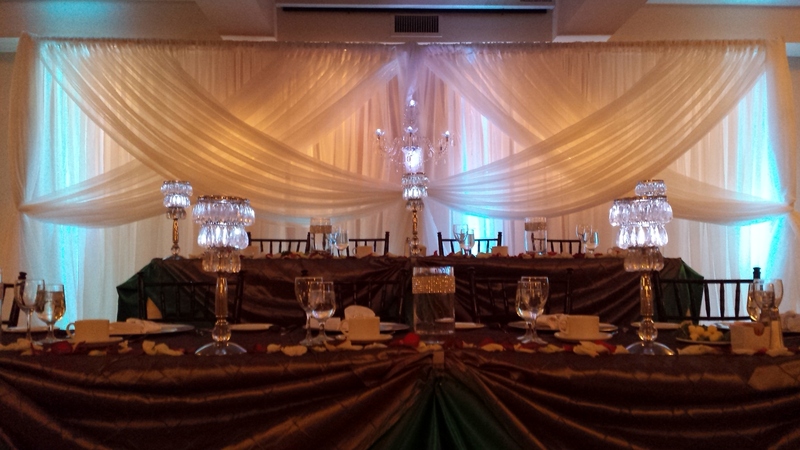 The chandelier for the backdrop was also showcased with our mini chandeliers for the head table, all of these lights had mini LED lighting inside them. 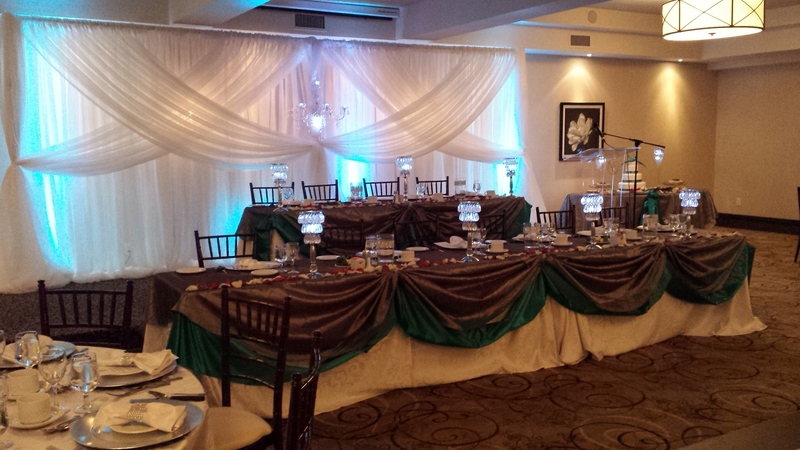 The LED lighting flowed to under the head table as well, bringing the whole look together. 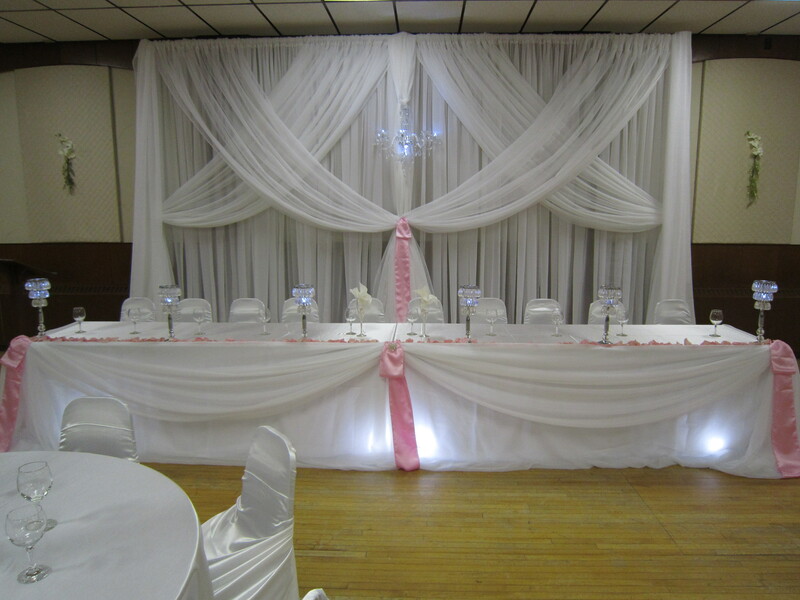 Set The Mood Decor provided the white satin pillowcase style chair covers, which tie nicely in the back to create an elegant flowing look. 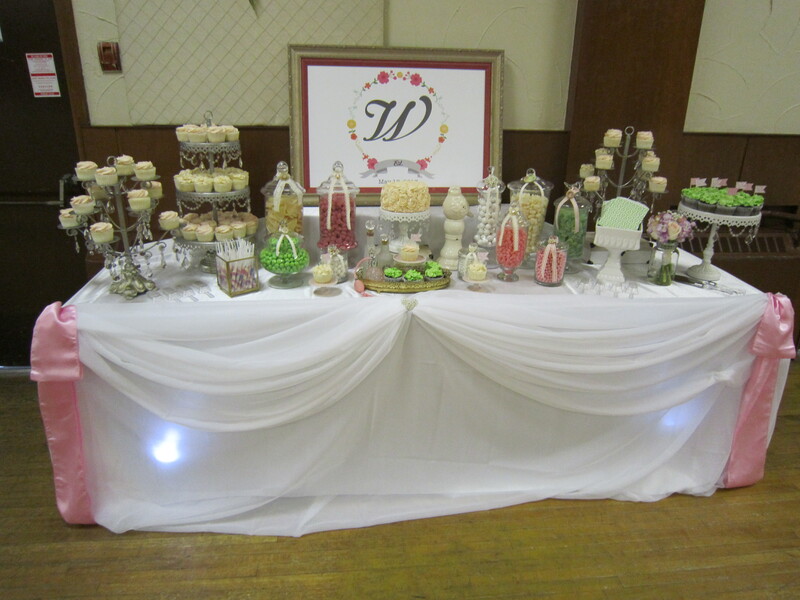 The head table / cake table – candy table draping and the receiving table draping. 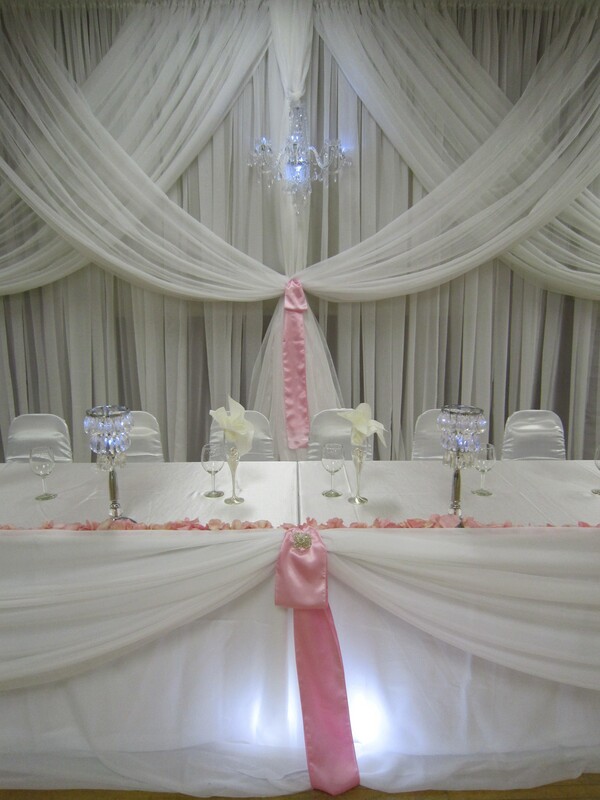 With skinny light pink satin swag and crystal brooches to complete the look. Our Bling money box was used on the money table. 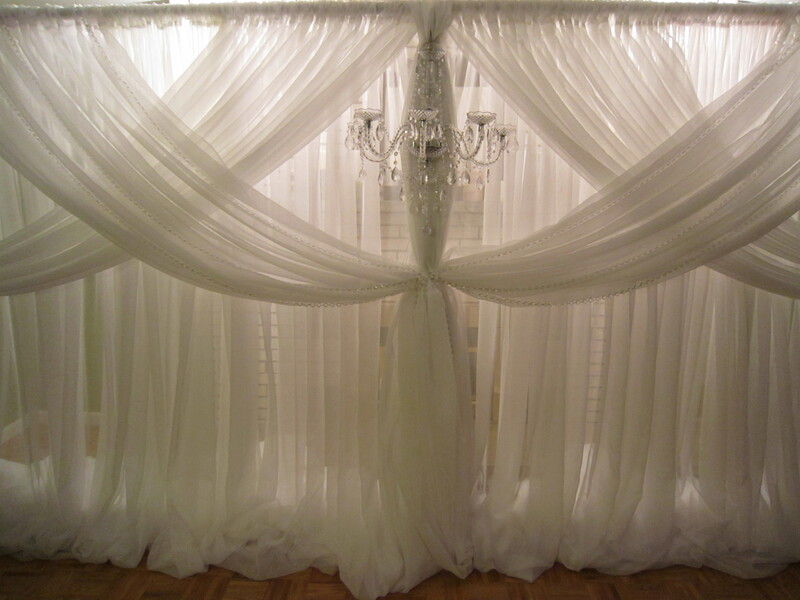 We have been very busy lately working on our 2013 packages, which include our new chandelier backdrop, seen below. A rustic centerpiece with sticks and mason jars, which will be a rental, (photo’s coming soon) and a tea party centerpiece, coming soon. 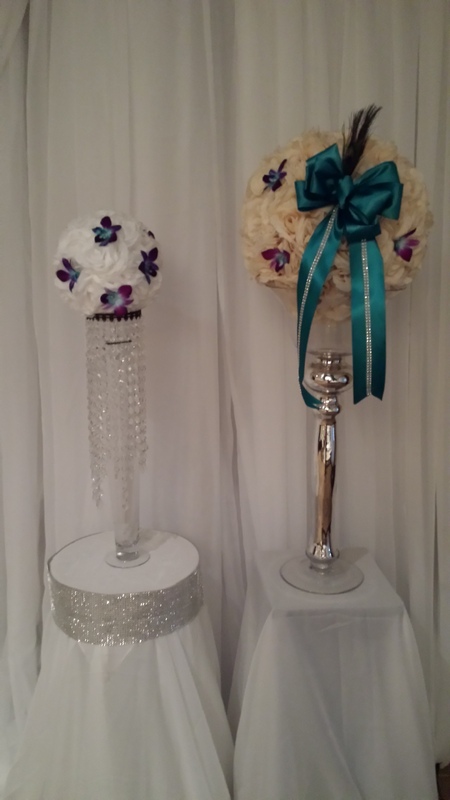 We have also been working on sharing our items with brides out of our general area by starting up an Etsy store – Rocheleau Designs by Set The Mood Decor. 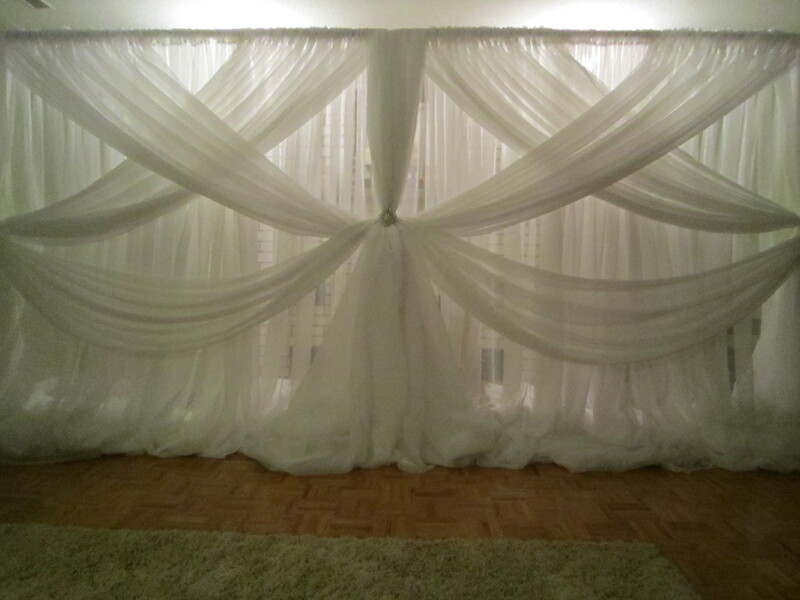 Our store will be featuring wedding items, baby shower items, holiday decor and home decor. We have just started with wedding and holiday and are slowly adding more items. In between all of this we are doing a full holiday decor setup – to feature photo’s of how we decorate for Christmas, some new styling in our house and planning a reception for my very own mom in June 2013. Don’t forget about Pinterest – which we are in love with and the always popular facebook! We are excited to have a busy year ahead of us and to be growing everyday, thanks to all of our past brides and customers!